A SpaceX Falcon 9 rocket carrying the GPS III SV01 navigation satellite for the U.S. Air Force stands atop its launchpad at Cape Canaveral Air Force Station in Florida as day breaks for a launch attempt on Dec. 22, 2018. The launch of a SpaceX rocket carrying advanced GPS satellite for the U.S. Air Force on Saturday (Dec. 22) has been delayed for 24 hours by high winds over the mission's Florida launch site, company officials said. 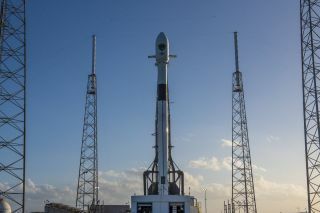 A SpaceX Falcon 9 rocket was minutes from launching the new GPS III SV01 satellite, the first of a new breed of U.S. navigation satellites, from a pad at Florida's Cape Canaveral Air Force Station (liftoff was set for 9:21 a.m. EST, or 1421 GMT) when the company officially stood down for the day. Flight controllers had been tracking unacceptably high upper winds throughout the otherwise smooth countdown. Saturday's delay is the latest holdup for GPS III SV01 launch. SpaceX tried to launch the navigation satellite Tuesday (Dec. 18), but an unexpected sensor reading on the Falcon 9 rocket's first stage forced the company to stand down for two days to study the glitch. Foul weather thwarted a second launch try on Thursday (Dec. 20), prompting the slip to Saturday. The GPS III SV01 satellite was built by Lockheed Martin and is the first of a new fleet of ultraprecise navigation satellite constellation for use by the U.S. military and civilians. Nicknamed Vespucci (after Amerigo Vespucci, namesake of the Americas), the SUV-sized satellite will replace the aging SVN-43 GPS satellite. which launched in July 1997, Air Force officials have said. The flight of GPS III SV01 is SpaceX's last mission of the year and will mark the 21st launch of 2018 for the Hawthorne, California-based company.